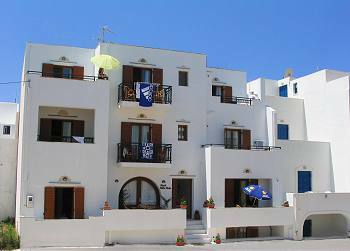 A new hotel situated near the centre of Naxos town, only 150 metres from it, within easy walking distance from the marvelous sandy beach (100 metres) right next to all amenities -super markets, bakery, entertainment. Hotel Villa Flora consists from 9 well equipped luxurious studios of one or two rooms for 2, 3 or 4 persons. All rooms are air-conditioned with private WC, shower, balcony or veranda and are fully equipped with satellite tv, kitchenette, refrigerator,hair dryer, free internet access,direct telephone and safe box. The atmosphere is very friendly with authentic Greek hospitality. For customers who are looking the very best accommodation their money can buy. We offer free transfer to / from the port / airport, internet access, living room, fax service and daily maid. In the morning, filter coffee, iced tea and orange juice is offered at no extra charge.